Medical offices are tasked with keeping patient costs reasonable, while keeping private medical information secure. The demands placed on healthcare facilities are significant, and choosing the right office equipment for medical offices is vital. Medical professionals are required to keep thorough and accurate records on all patients, but an increasing number of practices are switching to paperless recording. Deciding to switch to a paperless medical office will save time and lower costs, and it will also affect your equipment purchases. Higher-end multifunction printers can be integrated with document-management, billing, e-prescribing and email applications. Choose a scanner that will convert documents into searchable and encrypted formats. If you lease, rather than purchase equipment, find out if there are options for clearing the machine’s memory, so that your private data is not saved and viewable by an office supply company or anyone who leases the equipment in the future. There are several factors to keep in mind when selecting computers and mobile devices for your office, but portability can be a double-edged sword. Laptops, smart phones, USB drives and even wearable devices are now in widespread use throughout the business world; however, security risks increase when an item can be lost or stolen. Any device chosen for its ease and portability should also include advanced security features. Simply setting a password may not be enough to protect important data. When choosing office equipment for medical offices, it’s also important to ensure that all computers and mobile devices comply with State and Federal medical privacy laws. Any computer or mobile device that you purchase should be compatible with your office systems and software. It’s also helpful to choose devices that can communicate information easily back and forth. If information can only be accessed from one device, this can cause complications and ultimately hurt your bottom line. No matter how many patients you serve, data backup and security are necessary components of maintaining your business and medical files. Electronic records are of no use if your network is breached and your data is lost. Patients rely on you to keep their medical information safe, and compromised data can ruin the reputation of a medical office. The AMA published specific guidelines for allowing patient access to medical records and keeping them safe. It’s advisable to prepare for a disaster before it occurs. Any medical or personal data should remain safe from loss or corruption. Backing up data to an offsite location is one of the easiest ways to do this.. Consider keeping one physical backup, along with one stored in the cloud. Frequent automatic backups of a server should be scheduled to keep files safe. When deciding on a cloud solution, make sure that the service provide allows for the storage of encrypted data. Medical offices should choose business-grade security software. Access to data on both laptops and desktops should be restricted. Any mobile devices and tablets that are used should be included in your security plan. Absolutely every computer in a medical office should be equipped with appropriate anti-virus software. A single virus on one device could corrupt or completely destroy all of your medical or business data. Medical offices use many different tools to produce medical records, schedule patients, bill and prescribe medications. When purchasing software or hardware for a medical practice, ensuring that all programs can be integrated is important. The Health Information Privacy and Accountability Act (HIPAA) sets forth mandatory rules for how medical offices protect the privacy of their patient’s protected health information. While the U.S. Department of Health and Human Services, who are responsible for HIPAA enforcement, understand that not all disclosures can be prevented, they do expect that certain privacy measures are put into place. Medical offices should take reasonable precautions to safeguard patient privacy. Purchase office equipment for medical offices with security compliance in mind. When purchasing portable office equipment, such as laptop computers, remember that these items could potentially be lost or stolen. Any portable equipment should have the capability of saving files in an encrypted format, so that private medical information is not accessible to any individual who steals or finds any equipment belonging to your medical office. It’s important to choose a supplier who frequently provides office equipment for medical offices and understands your unique needs. The right partner will help you to manage your costs, while staying compliant with State and Federal regulations. You can count on Stone’s Office Equipment to design workflow and paper-handling solutions that are efficient and scalable, while keeping operating costs to a minimum. Call us today at 804-288-9000. When you think of “going green” you probably think of efforts that decrease a company’s negative impact on the planet…and you’re right! There are many organizations and resources out there that promote change and encourage better working environments to keep our planet healthy. But, that’s not the only reason to go green with your office printing. Another wonderful benefit is that going green can save you money! Think about the way your office operates now. Depending on the size of your company, you might go through hundreds of sheets of paper everyday. In the process, you’re also using a lot of supplies, energy, and time. In fact, according to GreenPrint, the actual cost of printing is up to 31 times the price of the paper you use, and the cost of printing for the average employee lands between $600 and $1,300 per year! But, you can utilize green printing practices to improve efficiency and decrease the resources it takes to print and manage paper, all while saving your company money. You receive an evaluation of your current printing system to identify opportunities for improvement. These opportunities may include printing supplies, equipment tuning and repair, equipment configuration, and more. You’ll get a customized recommendation of how you can best run your printing equipment for optimal efficiency. By improving the areas that are identified, your company will use less energy to operate and you’ll notice long term savings in operational costs. Identifying how many printers you need. Many companies use more printers than they really need. By decreasing the number of printers and placing them in more convenient locations, your company can decrease the equipment needed and the resources it takes to run those extra units. Changing bad user habits. MPS will use data to figure out how the printers and other equipment are being used and then determine habits that could be curtailed to improve efficiency and savings. Tweaking equipment settings. Many people aren’t sure what settings are truly best for printers and the majority just settle with whatever the factory settings were. Using MPS, you can fine-tune the settings of your equipment to ensure you’re always getting the most from your equipment, with the least energy demand. Going green with your printing will help your business become more socially responsible while also saving money. Managed print services is the most effective and convenient way to get the most from your printing system. For more information on managed print systems, contact Stone’s Office Equipment at 804-288-9000. Whether you’re going it solo or setting up a large practice, making smart choices when purchasing office equipment for a law firm can mean critical differences in workflow and efficiency. The most successful solutions will be scalable, easy to use and flexible enough to make sure focus stays on the work, not the technology. The basics of a law office are the same as many other business offices, but law firms must also address regulatory compliance requirements that govern privileged data. Legal teams produce reams of documents, but that doesn’t mean that all those documents have to exist in hard copy. Making the decision up front to run a (nearly) paperless office will save piles of time and money, and will affect your equipment purchases. If you’re on your own, an entry-level, all-in-one desktop unit might do what you need it to, but you’ll sacrifice some efficiency — especially when scanning. Even the smallest practices should look into high-volume scanners with network capability. Ultimately, you want your scanner to integrate seamlessly with your document-management software. 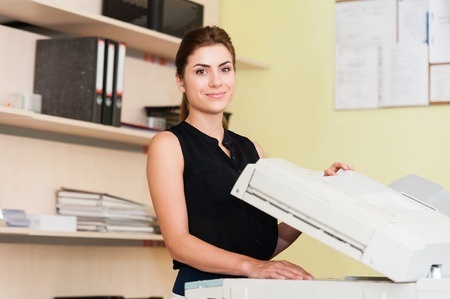 Larger offices that commit to taming the paper beast should elect higher-end multifunction printers for purchase or lease. Look for models that can be integrated with document-management, time-tracking, billing and email applications as well as cloud storage. Be sure the scanner will convert documents to searchable and encrypted formats. When leasing, find out what options are available for clearing the machine’s memory of your data. Plan device purchases carefully. If you’re a one-person shop, a business-grade laptop might be all you need. Larger practices will likely want to anchor support personnel with desktops. Attorneys will need either desktops or laptops, depending on their mobility needs, and tablets if budget allows. Before buying tablets or other mobile devices, check to see what apps are available to accompany your desktop software solutions. When looking at specs for desktops and laptops, look for at least 8GB of RAM — 12GB if you can afford it — to help run multiple applications more efficiently. Mobile devices (like tablets and smart phones) can be linked to your office equipment to provide remote printing. No matter the size of your practice, data backups and security are critical components of a law firm’s IT infrastructure. All those documents you’ve scanned are worthless if your network is breached and your data is lost, not to mention the legal ramifications and damage to your firm’s reputation if privileged data is compromised. Consider a redundant backup solution: Keep one physical backup and one cloud backup. For very small practices where employees save documents and other data to their local drives, your physical backup could be as simple as an encrypted external hard drive. Larger firms should schedule frequent automatic backups of their servers to encrypted-drive backup locations. When looking for cloud solutions, make sure the service provider allows storage of encrypted data. Choose business-grade security software and learn how to use it effectively. Enable system encryption to restrict access to data on laptops and desktops. Be sure to include practice-owned and personal mobile devices in your security plan if they access your network. Don’t take risks with your privileged data. If you can’t afford to keep an IT security expert on staff, hire a network security firm to secure your systems. The American Bar Association has done an extensive comparison of practice/case management software and offers tips and resources on encryption. If you’re in solo practice, you’ve no need for a business-grade phone system. You can get the basic features you need — voicemail, caller ID, conferencing, call forwarding — as part of most landline, VoIP or mobile packages. If you want to give the impression of a larger office, check out call-management solutions that include the ability to set up a simple menu. You can even hire a virtual receptionist to answer calls for you from a call center. Most pricing plans allow you to buy a monthly pool of minutes, so you’ll have to track your usage carefully to avoid surprises when the bill comes. Larger firms will need more extensive setups with multiple-line phones, a network of voicemail boxes and professional installation. You’ll still need to choose between landline and VoIP. If you opt for VoIP, you’ll need to decide whether to use a cloud system or host it yourself. Projectors are available to fit almost any budget. Add a screen (or a white wall in a pinch), and you’ve got a solid, basic presentation setup. If your room is very small, skip the projector altogether and go for a mounted monitor with a dedicated computer or a wireless connection. Interactive display boards offer a higher-end solution and have a variety of features, including touch screens, pen interfaces for annotating presentations and video conferencing. Digital dictation tools make a first draft of your dictation as easy as docking a voice recorder. Files can then be sent to speech-recognition software or an assistant for transcription. Many models offer real-time file encryption and device-locking features. Some systems include barcode integration, which allows you to attach client information to the recording by scanning a barcode. At Stone’s Office Equipment, we’ve worked with many law firms – some small, some large. We understand the need and challenges facing law firms in today’s economy. You can count on Stone’s Office Equipment to design workflow and paper-handling solutions that are efficient and scalable, while keeping operating costs to a minimum. Does it seem like your IT department is constantly responding to issues with your office equipment? Well, you’re not alone. In fact, many large IT departments spend up to 25% of their time dealing with device management. That includes ordering supplies, repairing equipment, installing new devices and more. But your IT department stays busy. That’s a good thing, right? While it may seem like you’re getting a lot out of your IT personnel, the reality is that these tasks are actually holding your IT department–and your business–back! The more time IT workers spend on fixing and maintaining your equipment, the less opportunity they have to work on projects that will really allow your business to grow. Not only will MPS help your business by freeing your IT department to work on more rewarding projects, your office will run more efficiently and be constantly improving. With your print management improving and your IT productivity increasing, you’ll certainly realize the benefits of having Managed Print Services in place. Allow your IT department to do more for your business by freeing them from print management duties. See how your business can get started with Managed Print Services that are tailored just for you. Call Stone’s Office Equipment at 804-288-9000. Like many businesses, you probably work with multiple different vendors. Staying in touch with all those vendors can be extremely time consuming and distracting, especially when you have to take care of all the other elements of your business. Even if you have a separate accountant or accounting department, they have to spend a lot of time following up with vendors to ensure invoices are received by the right supplier, for the right services, at the right times. This usually requires a separate invoice for every vendor, and often a separate invoice for every product or service if they were not order or performed in the same purchase. Dealing with multiple vendors for your printer fleet may be an area where your team can make some major efficiency improvements. Many businesses rely on separate vendors to provide ink and toner, parts, service, and repairs. This can make billing extremely cumbersome for your accounting staff. One solution is to source all your printer-related products and service from one vendor and receive one monthly invoice with managed print service (MPS). This can free up your internal resources for much more productive tasks. Managed print services (MPS) helps business reduce time and money spent on printer related up-keep by implementing print controls to reduce unnecessary printing and streamlining your devices for maximum efficiency. MPS consolidate the source of labor and parts necessary for maintaining your printer fleet, so your employees can focus more on serving your customers. Learn more about MPS programs customized for your specific business contact Stone’s Office Equipment today. For over 45 years, Stone’s Office Equipment helping central Virginia businesses save money on office related expenses. We provide award winning service and represent top office equipment brands like Panasonic, IBM, Lexmark, and Sharp. We optimize printing operations, document management, and managed IT services to increase businesses’ productivity and reduce operations costs. Is Managed Print Service (MPS) Right for Your Business? Managed Print Services (MPS) manages and maintains your organization’s printing to reduce costs and increasing productivity. You don’t have to be a large, global company to benefit from this service. MPS can be beneficial for companies of all sizes, industries, and printing needs. Will MPS provide ROI for your business? To find out if MPS can work for your business and ensure you’ll get a return on your investment (ROI), start by ask yourself the following questions. Is our current print environment handling our office’s needs? Are our current devices cost effectively handling our workload? Is our current print strategy flexible enough to adapt to inevitable changes in technology? Is our print environment adequately protected from security threats? Does our IT staff waste time servicing printers? Will MPS provide adequate ROI (may need to contact an MPS provider to answer this question)? Still wondering if MPS could save your business valuable time and money? Read some MPS cases studies and see the range of clients that have benefited from MPS provided by Stones Office Equipment. For more information about MPS, visit the MPS page on stonesoffice.com, or call Stones Office Equipment today to discuss your business’s printing operations and request an MPS quote. Stone’s Office Equipment has been saving central Virginia businesses and organizations money for over 45 years. We provide award winning service and represent top office equipment manufactures like Panasonic, IBM, Lexmark, and Sharp. Stone’s Office Equipment not only provides MPS. We also offer document management and managed IT services to increase productivity and cost-effective operations. Without controls and measures, your ink and toner cartridges run out long before they should. Inefficient devices end up costing you big in the long run. Your staff wastes time and money trying to maintain your imaging devices. With managed print services (MPS), all this printing waste can be significantly reduced! Stone’s Office Equipment will implement print controls to reduce unnecessary printing, and streamline your devices for maximum efficiency. We take a more proactive approach rather than reactive. Proactive management of your printer fleet allows you to do what you do for a living. Learn more about managed print services and how it can save your business money by contacting one of our offices today. Stone’s Office Equipment has been serving central Virginia for over 45 years, and represent the top office equipment manufactures. We specialize in optimizing your printing operations, document management, and managed IT services to increase productivity and cost-effective operations. Managed Print Services can save both time and money. Have you ever considered how much time your employees spend on printing-related tasks like ordering supplies? 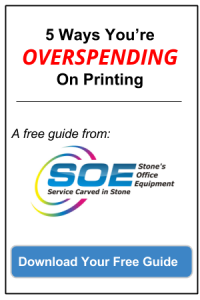 Have you thought about how much your company spends on printing? Often times when companies are focused on daily operations, acquiring new business or servicing customers, the office equipment and printing process gets overlooked. If your staff is spending time fixing paper jams, dealing with equipment downtime, or ordering supplies, they could probably spend that time more wisely in your business. In many cases, small changes to a print environment can save 20%-30% through decreased direct costs, and increasing efficiency. For more information about managed print services or to discuss your options regarding transferring the management of your printing equipment over to Stone’s, contact one of our offices today. Stone’s Office Equipment serves businesses, non-profit organizations, and institutions throughout Central Virginia with full service office equipment sales and repair, managed print services, document management, and managed IT services. Is Managed Print Service Right For Your Company? Companies of all sizes are under the same pressures when it comes to how much time employees have to complete projects and tasks assigned to them. There are only so many hours in a day and in some cases, paying overtime isn’t an option that makes financial sense. IT departments, regardless of their size, are no different. They don’t want to manage copier, printers or other document output devices. Printers and copiers may be important to the everyday operations, but IT departments have far more important responsibilities and critical duties to focus on. At the end of the day, companies just want the print devices to work! Most businesses do not know how many printers they have, or how many different models of printers they have. They have no idea how many prints are being made, or who is making them and why. Toner purchasing is usually handled by another department without regard to how much is being spent to maintain the print devices. How does MPS help with this office problem? By identifying and labeling mismanaged equipment that is costing businesses money. Looking at processes like; toner replenishment and ordering, service tickets and repair calls. Studying workflow techniques and finding a better solution. We often hear businesses say, “We’ve always done it that way.” That’s fine if your business has never changed; however, chances are your business has changed. Simply look at the improvements over the past few years in the mobile arena, with smart phones and tablets. Technology changes the way everyone does business. Managed Print Services helps to identify these possible deficiencies and rights the ship. We can help centralize printers to the volumes demanding them, replace worn parts and take over toner purchasing. All of this relieves the IT personnel from chasing menial issues that take them away from what they were hired to do for your business. Yes, Managed Print Services is right for your company and Stone’s Office Equipment will show you how we can help and then we will show you why we are the right choice.